Kenya’s fight against corruption receives major boost as Britain signs agreement on repatriation of stolen wealth – Kenyatta University TV (KUTV). All Rights Reserved. At State House Nairobi today, President Kenyatta and the visiting British Prime Minister Theresa May witnessed the signing of an agreement on the framework for the return of assets from corruption and proceeds of crime hidden in off-shore accounts by corrupt individuals. Britain becomes the third international partner- after Switzerland and New Jersey- to support Kenya’s war on graft through the signing of agreements aimed at repatriation of assets and monies acquired through corrupt deals back into the country. While thanking the British Government for its commitment to the fight against graft, President Kenyatta said there was no turning back on the war on corruption and economic crimes adding that the sustained drive was part of his legacy in addition to the Big 4 agenda on affordable housing, universal health care for all, manufacturing, food security and nutrition. “There is no turning back in Kenya on this agenda. Fighting corruption is an important aspect for my legacy besides the Big 4 agenda ,” President Kenyatta told an international Press Conference that he jointly addressed with the British Prime Minister shortly after the two leaders led their respective delegations in bilateral talks. President Kenyatta said corruption must be made painful and less rewarding to deter people from engaging in the vice. “We welcome your commitment and drive to fight corruption. We stand with you. Whatever is held in the UK will be returned to build Kenya,” said the Premier. 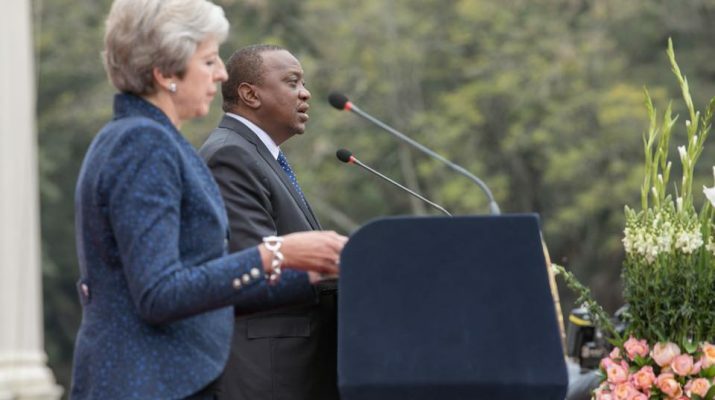 On Kenya’s desire to secure a non-permanent seat at the UN Security Council, the British PM said her country will work with Kenya to ensure it achieves its intended goal . The PM assured Kenya of continued access of the UK’s markets through the current duty free arrangement in the even after Brexit (exit of Britain from the European Union) on 29 March 2019. She said talks between Kenya and the UK are underway to come up with a new framework of trade. The PM noted that Britain and Kenya have had a long trade and investment partnership which will be enhanced under the post-Brexit arrangement. PM May who led a strong 29-member delegation of business executives said trade links between the UK and Nairobi will continue to be strengthened to enhance economic partnerships adding that many investors from her country have an appetite for investing in Kenya. He thanked the UK for accepting to participate in the Blue Economy Conference scheduled for Nairobi in November by committing to contribute an estimated Shs. 35 million. He said British businessmen have great opportunities to invest in the Kenya’s emerging blue economy sector by putting up landing facilities for deep sea fishing, ship building facilities, fish processing and packaging facilities in Kisumu, Homabay, Lamu, Malindi, Msambweni and Mombasa- which will also enhance the Big-4 agenda through job creation. On regional security and peace, the British Prime Minister lauded Kenya’s efforts to stabilize Somalia and the signing of a peace deal in South Sudan under AMISOM and IGAD respectively. Prime Minister May said that through security cooperation between the two countries Britain has managed to put behind bars terrorists and child traffickers adding that Britain will soon announce a new aid package in support of AMISOM forces in Somalia.